Investigators are expected to share with other researchers, at no more than incremental cost and within a reasonable time, the primary data, samples, physical collections and other supporting materials created or gathered in the course of work under NSF grants. Grantees are expected to encourage and facilitate such sharing. See Award & Administration Guide (AAG) Chapter VI.D.4. To that end, researchers are now required to submit a Data Management Plan with their grant requests, detailing how the project will comply with research sharing guidelines set forth by the NSF. These requirements leave researchers with a choice: either come up with a plan on their own, or seek help from their institutions on a comprehensive data sharing and preservation model. Fortunately, the resources and tools exist at Rutgers for its researchers to easily take the latter route. In anticipation of these data sharing requirements, the university has setup a site to guide researchers through the ins and outs of data sharing. The Rutgers University Research Data Archive site clearly explains the importance of sharing and preserving research data, and details some of the current offerings for researchers who need a platform to share their research data to comply with NSF guidelines. It goes without saying that one such option listed on the site (and the platform I recommend) is the Rutgers University Community Repository. 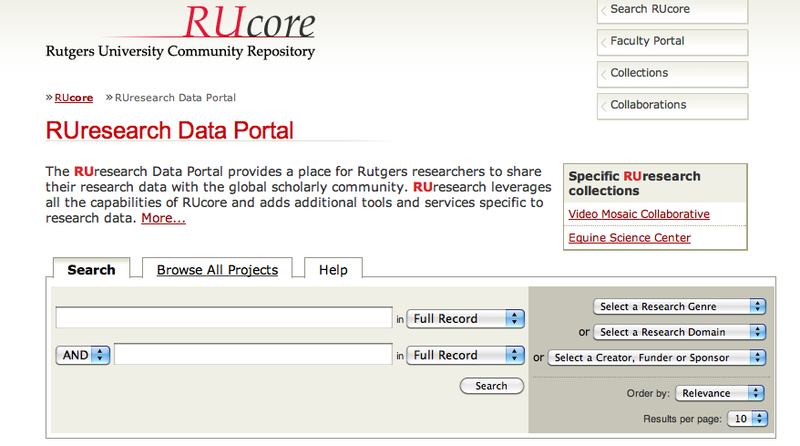 In anticipation of this need, the RUcore team has developed the RUResearch Data Portal, a section of our digital repository meant specifically for serving research data needs. Already trusted by faculty members to store their academic publications, and the mandatory platform for Theses and Dissertations in the Graduate School of New Brunswick, RUResearch is a natural extension of RUcore’s mission to preserve and make accessible the university’s academic output from a centralized resource that adheres to established digital preservation standards. With RUResearch, you can not only be assured of meeting NSF’s requirements on paper, but you will also have the security of knowing your research data is truly safe and preserved. More information on data preservation services can be found on the Rutgers Libraries Website, including dates for in-person presentations on the services we offer the academic research community. And, if you are a researcher interested in how RUcore and the RUResearch platform can help you, contact our Data Services Librarian, Ryan Womack, and he will be able to give you the information you need to get started.